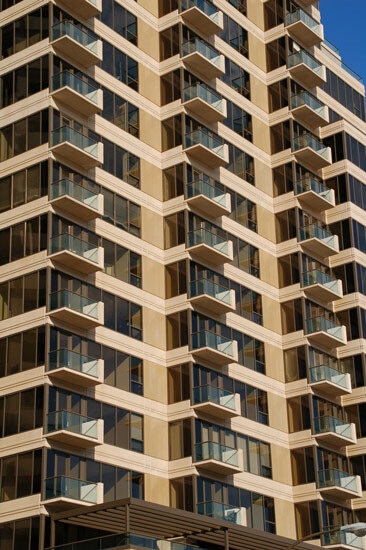 CarbonCast facade made under license from AltusGroup, Inc.
At 18 stories, 151 First Side was Downtown Pittsburgh’s first luxury condominium tower since 1968. Completed in October 2007, it was the catalyst for a wave of new downtown residential projects now underway in its vicinity. It was also the first commercial facade finished in thermally efficient CarbonCast Insulated Architectural Cladding. The building is located at Fort Pitt Boulevard and Chancery Street in the First Side (or Mon Wharf) portion of Downtown along the Monongahela River. The $28.6M, 200 ft. tower replaced a surface parking lot. Residents will find the location in the historic neighborhood to be easily walkable to the Cultural District, city parks, restaurants, Market Square, Station Square and the central business district. 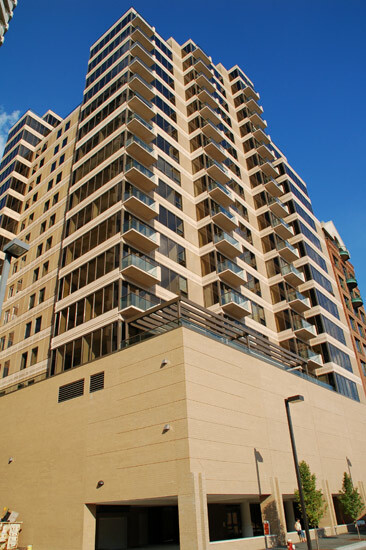 The tower offers stunning views of Downtown, the Monongahela River and Mt. Washington. Designed to be both contemporary and comfortable, its 82 condos range from 1000 to 3400 sq. ft.; units range in price from $290,000 to $1.8 million for penthouses. “Sandwich precast panels place the dewpoint toward the outboard area of the wall. They are very efficient thermally,” says Indovina. “The architectural precast panel gets rid of concern around water getting in and out because there are fewer opportunities for water infiltration,” he notes. C-GRID shear trusses provided the low thermal conductivity connection between the inside and outside architectural concrete wythes surrounding the insulation in the sandwich wall design. There are four levels of parking under the tower, two levels of which are above ground and concealed by the tower’s monolithic base. Inside, the garage is ventilated and also heated in the winter. Residents park in generous 9’ x 18’ front-in spaces that are easily accessed via a helical ramp configuration. “Precast allowed a large open glass area, and after all we were selling the view,” says Indovina. An all-glass facade would have been too cold. Pittsburgh is a traditional design city, and architectural concrete has the right residential feel. The plan of the building steps back from the corner of the site, with a four-part elevation in a variety of heights intended to mirror the city’s skyline. “We wanted to use the architectural precast panel to create interest, definition and plastic variation in the front elevation, says Indovina. 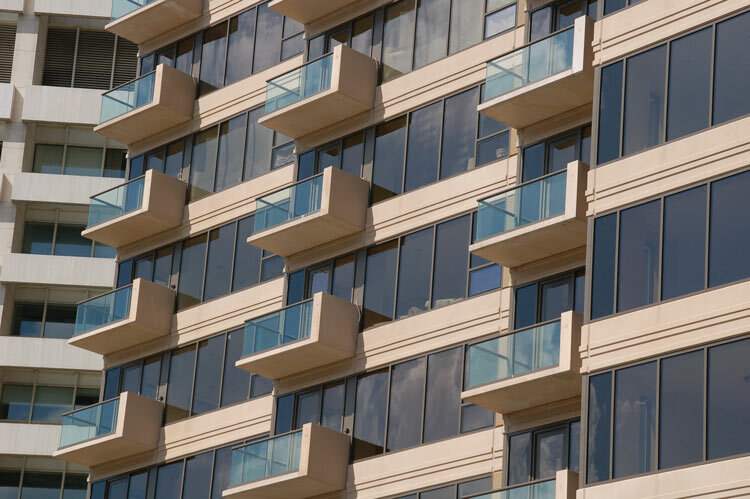 The designer created a combination of solidity and transparency that sets up an interesting rhythm in the front of building, then reinforced it with balconies.